“This is one of the most exciting jazz releases of 1995. Joe Lovano is showcased on four songs backed by a string section, is accompanied by a stringless big band filled with woodwinds and brass during four other pieces, performs Ornette Coleman’s “Kathline Gray” with a chamber group, takes two songs as duets with his wife Judi Silvano (who contributes wordless vocals), plays his own “Wildcat” as an overdubbed feature for his tenor and drums, and does a straightforward version of “Chelsea Bridge” unaccompanied. 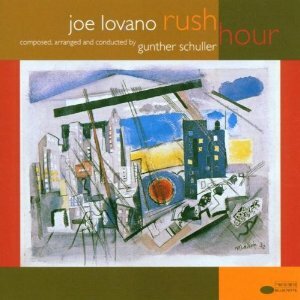 “Gunther Schuller’s arrangements for the larger pieces (which include three of his own colorful originals: “Rush Hour on 23rd Street,” “Lament for M,” and “Headin’ Out, Movin’ In”) expertly blend together Gil Evans-type orchestrations with aspects of modern classical music and freer forms of jazz, while allowing the music to swing. Silvano’s voice is also an asset on three of the orchestra performances, and trumpeter Jack Walrath briefly makes his presence felt. On Rush Hour, I finally had the opportunity to collaborate with Gunther Schuller and it was an extraordinary experience. Gunther wrote most of the arrangements, and a couple of originals, and I composed several things after he recorded the music he created. On Wildcat, which was my first recording on drums, I played the tenor part first, then overdubbed the drums on top if it. This was also my first recording that utilized overdubbing in this way. Topsy Turvey was done in a similar way. First as a duet, with Judi’s voice and my Soprano Sax, and then I overdubbed a drum part and a bass clarinet part, as well. The same with Juniper’s Garden. So my originals were conceived to be reocrded like that. Judi and I laid down the original duets, and the themes in our improvisations were very free and flowing. Then it was easy to go back on improvise on different tracks. Judi and I work together like this in many duet settings.